When travelling you never know what may happen, so insure against the worst. 1Stop Insurance offers FREE advice on the numerous types of travel cover available, choosing from a trusted panel of insurers to get the right cover for your trip. 1 Stop Insurance can tailor make a policy to suit your travel insurance needs. We can cover almost any activity or occupation including high risks sports like mountaineering or pot holing. 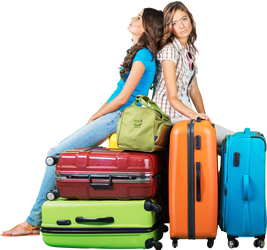 We can cover trips up to 18 months long and journeys to multiple locations. Add to this our expert advice from professionals with over 30 years experience and you can be sure that any drama doesn’t descend into a crisis. Hazardous activities and sports considered, including shark diving! 1 Stop Insurance even has a short term cover that can be arranged to cover those small trips to Europe where you choose to take your car in order to cover you against its breakdown. Contact us now for your personalised quotation – you’ll be glad you did.